Looking at the fishing boats on the port in Cassis, a nice change from the mega yachts. We collected our car shortly after landing in Nice, and headed straight to Cannes. One thing we did notice at Nice Côte d'Azur Airport was all the helicopter hire outlets where you usually see hire car rental. I can imagine they get pretty busy during the Cannes Film Festival! We saw an excellent Picasso exhibition at Le Centre d'art La Malmaison. Walking along the Promenade de la Croisette, Cannes felt a bit like Miami; strings of designer stores stud the boulevard in between luxury hotels (one of which, Hotel Martinez, is a fabulous example of Art Deco architecture), and glamorous clubs line the white sandy beach. Rosie enjoying one of the carousels on La Croisette. There was an energy in the air too, with preparations underway for the Cannes Film Festival taking place the following week. Around the Palais des Festivals, where the official event takes place, rolls of new grass was being laid to make sure even the flower beds were red-carpet-ready. 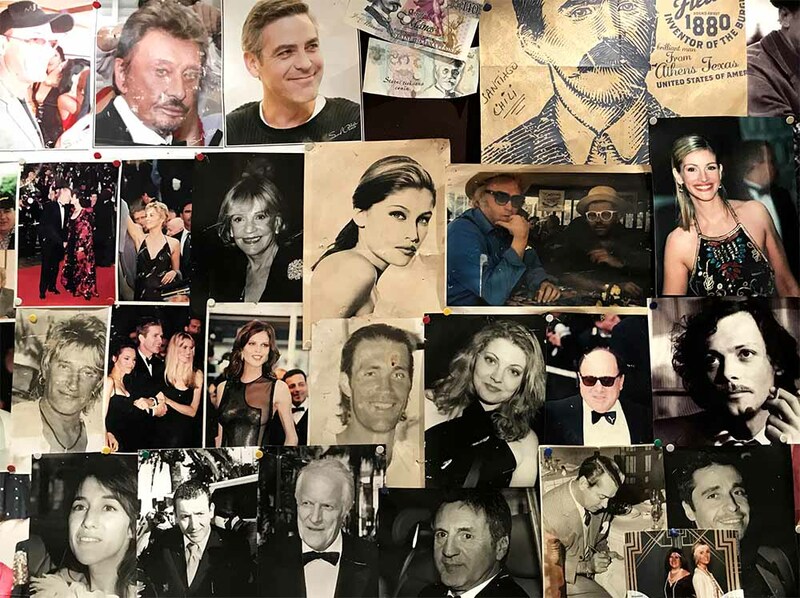 A wall of celebrity photos decorated the wall at the restaurant where we dined for lunch. Before the Côte d'Azur, and cities like Cannes and Saint-Tropez, became synonymous with mega yachts and celebrity, it was a favorite haunt of artists like Picasso and Matisse, among others. I wasn’t aware of the area’s deep artistic history until I arrived in Cannes; it was such a pleasant surprise to discover. While some hotels and restaurants proudly display photos of celebrities that have spent time within their walls, others have original artworks on display - from a time when some of the most acclaimed artists of the 20th century paid for their hospitality with a work of art. There is colorful public art all over Cannes. This piece is by the artist Romero Britto. Once we left La Croisette and explored the Old Town, the winding streets and cobblestones felt more quintessentially European. 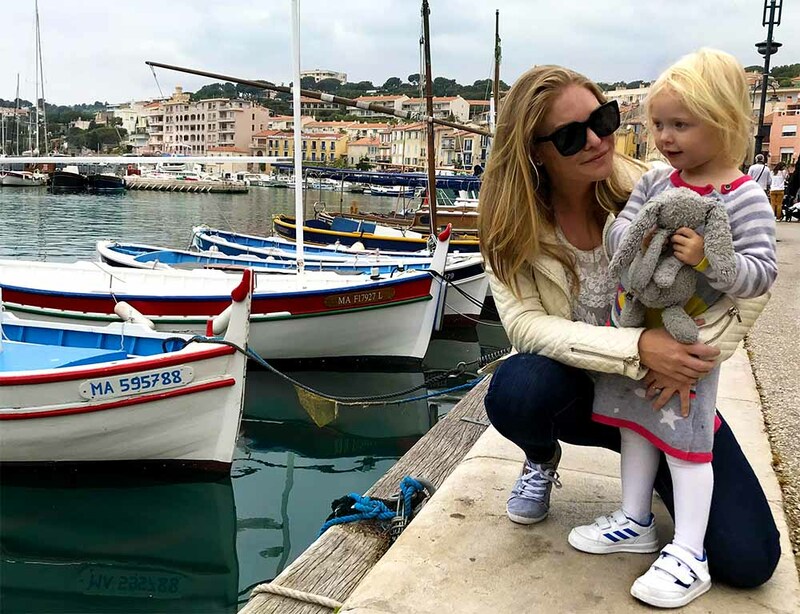 Up next on our whirlwind road-trip was Saint-Tropez, a short 1.5 hour drive from Cannes. We were lucky to get a last-minute room at Hotel Pastis, a chic boutique hotel right across from the sea, a few minutes walk into the heart of the city. Feeling ready for Saint-Tropez in my new hat and sunnies. Neither Cannes nor Saint-Tropez are very demanding cities to visit in that you don't feel obligated to see a whole host of sites. We wandered around the shops, ate ice cream in the sunshine, ogled at the mega yachts, watched some locals play pétanque, and simply soaked it all in. 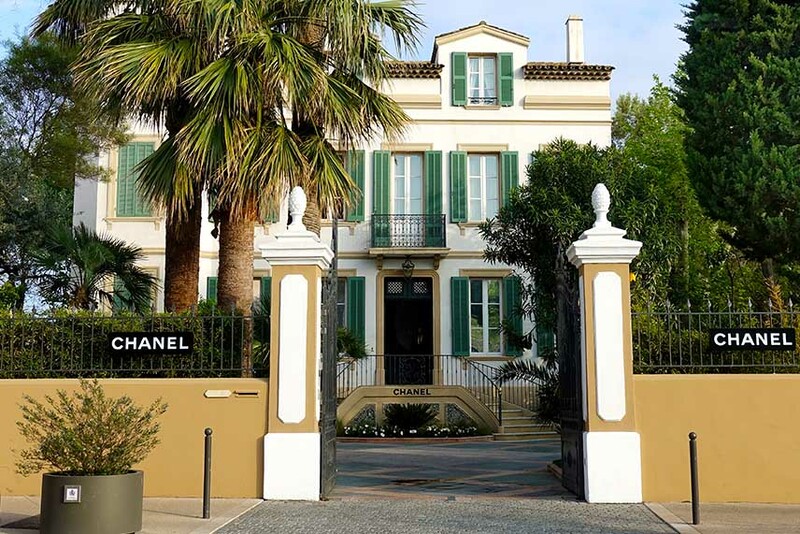 The very glamorous Chanel store in Saint-Tropez. We didn't bring Rosie's stroller on this trip, so she spent a bit of time on Justin's shoulders when the walking became too tiring. My pistachio ice cream from Barbarac was divine. Growing up in Sydney, I used to always choose pistachio ice cream from a shop near my home called 'The French Riviera' - so this felt very nostalgic. Rosie chose a delicious vanilla ice cream with big chunks of chocolate and hazelnut praline. Locals playing pétanque in Place des Lices, SaintTropez. Artichokes are in season in France at the moment, and I ate them at three different restaurants during this trip. We were introduced to traditional Provençal style of cooking them, known as 'à la Barigoule'. It was delicious, and I'm going to give it a try myself with artichokes from our local farmers market. 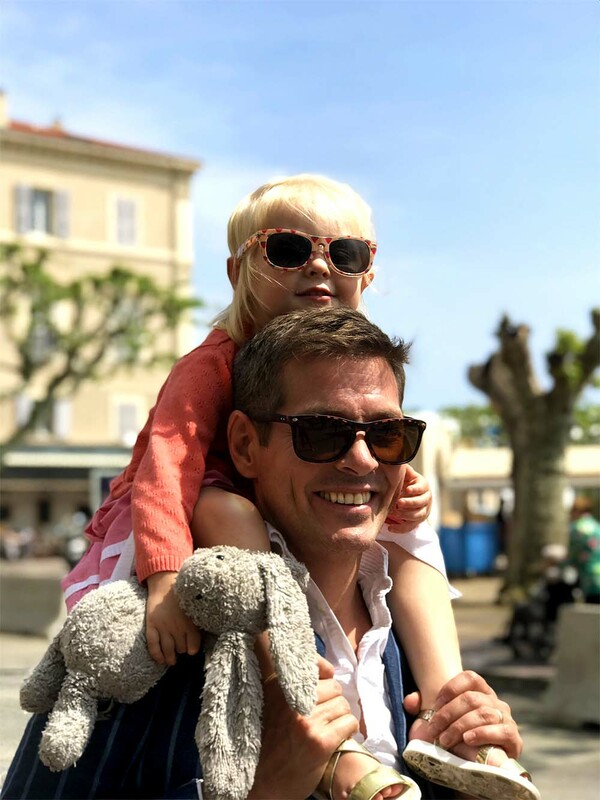 Our intention was to head from Saint-Tropez to Marseilles, but while googling for hotels in the car on the way I read about another seaside town called Cassis. We decided to make a little detour and check it out, but not before stopping for some wine tasting! Provence is known for it's rosé, which is what we enjoyed here at Clos Mistinguett. Cassis was idyllic, and absolutely packed with French tourists. Cannes and Saint-Tropez attract an international crowd, whereas we didn't hear anything other than French being spoken in Cassis. It was down-to-earth, very pretty, and lots of fun. A view of Château de Cassis from the port. We also stopped here at Domaine du Bagnol for one more delicious wine tasting. From Cassis we headed to Marseilles, in time for Bouillabaisse for dinner. In addition to being France's second largest city, Marseille is also the birthplace of Bouillabaisse, a traditional Provençal seafood stew made with a variety of different fish and saffron. It was exciting to taste one of my favorite dishes, made traditionally with Marseille rockfish. The Palais de Justice (courthouse), Marseille. I'm not exactly sure what we were expecting from Marseille, but it exceeded our expectations. A view of Basilique Notre-Dame-de-la-Garde from the port in Marseille. Parts of the city are very beautiful, with wide boulevards and grand architecture, but it also felt youthful, edgy, multi-cultural and creative. Rosie seeing herself in the mirrored ceiling at Marseille's ferry terminal. I particularly enjoyed exploring the antique shops and design stores along Rue Edmond Rostand. I've been on the hunt for vintage pieces for our new house, but ended up falling in love with this painting and bringing it home instead. Nu Aux Arabesques, by Gordon Seward. Sliced black truffle on toast, served with smoked fish and roe at Le Miramar. The last stop on our road-trip was Montpellier, a city with a reputation for having 300 days of sunshine each year. 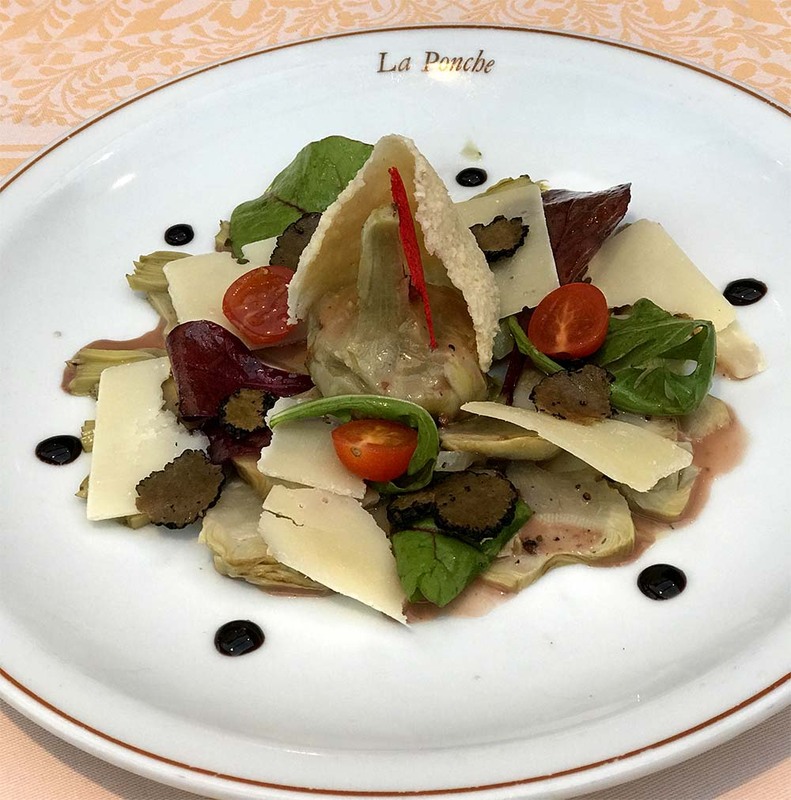 The concierge at our hotel recommended we try L'endroit for dinner, and it was the best meal of the entire trip by far. We walked through a series of winding ancient streets to find it - which is always half the fun - and thoroughly enjoyed their modern take on tapas. There were lots and lots of tiny restaurants in these streets, many of which served tapas or small plates, and the waiter told me that the area is very hip because it's catering to the large number of students in the city. If that's the case, these students are definitely eating and drinking with style! I'd heard about a big Sunday flea market which I was keen to explore in the morning, but the heavens opened and the day was a wash-out, so we skipped it. It's a good excuse to return to Montpellier again in the future, and all in all it was a fabulous, spontaneous few days of discovery. Rosie's final carousel of the trip, in Montpellier. P.S. Slow Travel in the South of France.